And while we've owned (and loved) almost every Apple Airport product, the line has been discontinued. And it was becoming clear we'd been left behind. At the same time, the demands on our wifi network continue to increase. We needed to move up to a mesh system, immediately. 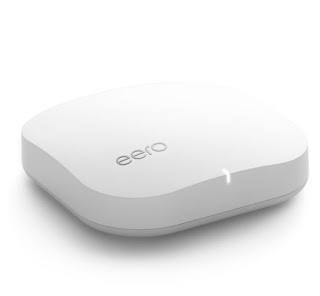 So.... goodbye Airport Extreme, hello Eero. When we started this blog, one of our long-range goals was "AirPlay Everywhere". To that end, we set up our wifi system with one AirPort Extreme, and several Airport Expresses, which acted as wireless bridges and extended the network. The AirPort Expresses ALSO acted as AirPlay hubs - we could generally stream music to whatever devices we wanted. However, AirPlay 1 was pretty limited - Sonos absolutely blew it away. So we moved forward with Sonos equipment, adding a Play:1, a Play:3 and a Connect, which was connected to our turntable. At that point I learned.... if you aren't using the Expresses for music, they're kind of bad. AirPlay 2 and HomePod replaced our Sonos... but there was still no room for our old AirPort Expresses - they didn't get the AirPlay 2 update. So, everything had to go. And Eero moved in. 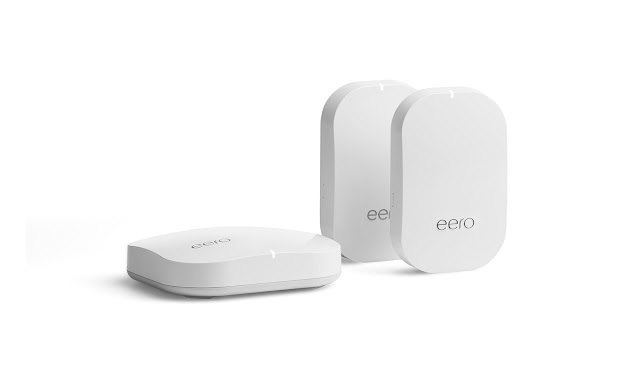 The Eero system had three parts: the base station, and two "beacons" - in form, extremely similar to our Airport Extreme + 2 AirPort Express units. The Beacons even plug directly into the wall! In function, however, they work differently. The AirPort + extenders system reached all corners of our house, but if you were moving around, the connection would switch between the Extreme (AC) and the Expresses (N). Sometimes, a device would switch between the two repeatedly. The Eero is seamless. As you move through the house, each Eero unit broadcasts part of the "mesh". Devices stay connected. Most of our Apple TVs are hardwired with Ethernet. The master bedroom TV, however, is on wi-fi. And it's been a mediocre experience. As soon as the Eero was set up, the wi-fi Apple TV was as responsive as the Ethernet TVs. It's just working better. We set up the Eero using the dedicated iOS app. It could not have been simpler. The app tells you when to unplug your modem and old router, and when to plug in the new Eero units. The pictures and animations are easy to understand. It's remarkably straightforward. Our total downtime was less than 10 minutes. The app provides a great deal of information about the speed of your network and the devices that are connected - it even provides Disney Circle-style control over access and "bedtime" for devices. The Eero Beacons have a really cool feature - a night light that can be controlled and automated via the Eero app. However, the light is at the "bottom" of the unit - and that assumes that your light sockets will be in a "vertical" alignment. Ours are "horizontal", with the sockets side-by-side. In this configuration, the night-light is pointing sideways. 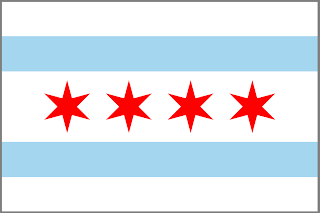 Still acceptable, depending upon the location - but less useful. It would be REALLY cool if future Eero Beacons allowed us to rotate the plug-in prongs. All told, this is a spectacular replacement for the AirPort Extreme router. It's not a first-party Apple product, and I'll admit that I miss that - but it has the same all-white styling, and the Beacons could easily pass for an updated Airport Express. Most importantly - setup was quick and easy, and the family noticed an immediate, obvious improvement in our home network. The Eero + 2 Beacons sells for about $400, so it's a reasonably large investment. We were able to sell our Airport Extreme routers and (sadly) the Sonos connect to defray the cost. Keep in mind, though - it's an expandable system. You can start with a single Eero base station at $200, and add Beacons (or more base stations) as you go along. Our Verdict: Four stars. It does everything it says it will do, extremely well. I'd love if the Beacons could rotate, but "my router's night-light shines sideways" is a ridiculous complaint." Buy it.